#1 Selling Shackle Worldwide, Year After Year! 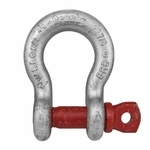 The Crosby G-209 Screw Pin Anchor Shackle is perhaps the best known rigging shackle in the industry. It is also a hallmark product for Crosby...a piece of rigging hardware that is almost instantly recognizable by its user. Other manufacturers may offer lower pricing or even boast higher Working Load Limits with their shackles, but over time, no rigging shackle will bear more value than this one. Crosby G-209 shackles are made from forged steel. They are Quenched and Tempered with alloy load pins, and feature a hot-dip galvanized finish. Each shackle is fatigue rated, meaning it can be subject to continuous use time and again without failure (always obey Working Load Limits). Look for the Red Pin . . . the mark of genuine Crosby quality!